Decal sheet, full colour instruction sheet in a resealable bag. Informative instruction sheet, high quality decals in perfect register, thin carrier film and a compliment of stencil data. 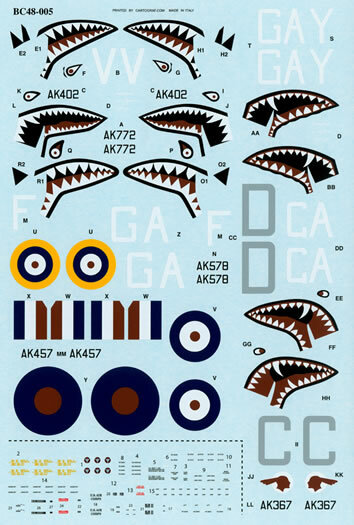 Roy Sutherland of BarracudaCals has just released a rash of new P-40 decals in 1/72, 1/48 and 1/32 scale. The sheets carry on from his earlier P-40 releases and now provide you with all options in all three popular scales. This sheet – BC48005 - provides markings for five aircraft of 112 Squadron Royal Air Force when they flew as a part of the Desert Air Force in the early years of World War Two. 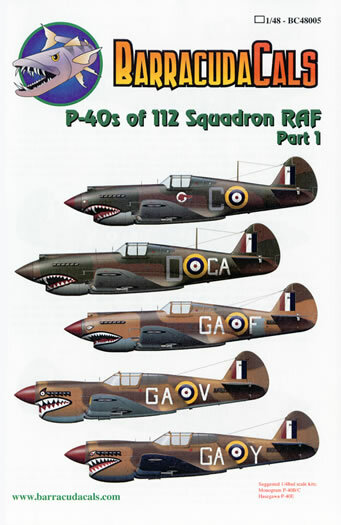 Interestingly, and as an aside, it is reputed that 112 Squadron were the originators of the shark mouth markings applied to P-40s. Curtiss Tomahawk Mk. IIb, AK402 assigned to Pilot Officer Neville Duke Royal Air Force (one of the highest scoring Commonwealth aces World War Two) at Fort Maddelena, Libyia in the November of 1941. This option (as well as the other two on the sheet) is finished in dark earth and middle stone over azure blue. The placement guide advises that the machine was delivered in the Curtiss factory scheme of dark green, dark earth and DuPont (the name of the paint company) light grey. To better suit the desert environment in which the aircraft were to be operated in the dark green was over painted with middle stone which was applied freehand with a spray gun in the field and as such the demarcations between the upper colours are a little wider than normal. Azure blue replaced the light grey on the undersides. The aircraft’s serial number is painted on a dark green rectangle which was a result of a simple mask over when the middle stone was sprayed over the dark green. The dark green background of the serial is not supplied as a decal so you will have to paint this yourself. 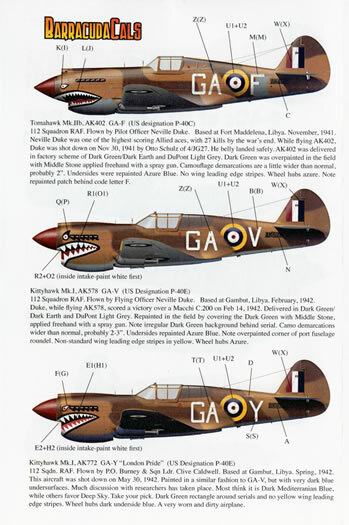 Other peculiarities with the machine include the lack of the yellow identification stripes on the leading edges of the wings and the azure blue “patch” behind the squadron code letter F.
Curtiss Kittyhawk Mk. I, AK578. This option is another of Neville Duke’s machines and based at Gambut, Libya in the February of 1942. Camouflage scheme is dark earth and middle stone upper surfaces over azure blue undersides. Again, it sports its serial on a dark green rectangle as a result of its repaint from its original factory scheme. Other peculiarities include the over painted left hand edge of port fuselage roundel and the non-standard yellow wing leading edge stripes. Curtiss Kittyhawk Mk. I, AK772 “London Pride”. This machine was flown by both Pilot Officer Henry George (Tom) Burney Royal Australian Air Force and Squadron Leader Clive Robertson (Killer) Caldwell Royal Australian Air Force (another high scoring Commonwealth ace) from Gambut, Libya in the spring of 1942. Camouflage scheme is as per the previous option except that the light grey on the undersides is replaced with a very dark blue rather than the normal azure blue. The notes on placement guide will advise you as to the whys and wherefores of this choice. 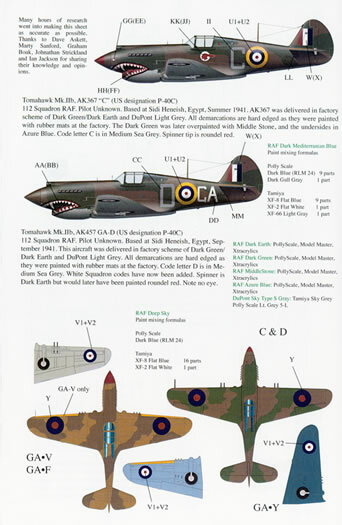 The same dark green rectangle around the serial, a lack of the yellow wing leading edge stripes and the partial over spraying of the roundel are the other features of this option. Curtiss Tomahawk Mk. IIb, AK367 flown from Sidi Heneish, landing ground Egypt, in the summer of 1941. The machine is still in the original Curtiss factory delivery scheme and looks to be ‘as delivered’ and before the squadron identification letters ‘GA’ were applied. It wears A red tip to its spinner, a large letter ‘C’ in medium sea grey and unusual for an RAF aircraft, it wears artwork of what looks to be an Indian’s head on both sides of the fuselage. It also sports the earlier form of the Squadron’s shark mouth marking that incorporated a larger ‘fang’. A ‘work in progress’ perhaps? Tomahawk Mk. IIb, AK457112 flown from Sidi Heneish in the September of 1941. This option is also in the Curtiss factory delivery scheme but wears the squadron’s ‘GA’ identification letters in white but still wearing a large medium sea grey letter ‘D’. It wears the early shark mouth marking sans the eyes. Another ‘work in progress’. The decals themselves have been printed by Cartograf. The whites of the codes and national insignia appear to be dense enough to survive application over a dark background and there is a minimum of carrier film surrounding each subject. Everything is in perfect register, including the tiny Curtiss logos for the propeller blades. You get a single set of national insignia and two very comprehensive sets of stencil data – the stencil data even extends to the placards that were applied to the cockpit interior. Separate shark mouth squadron markings are provided – a set for each option. These are ‘handed’ and have been printed with slit in them so as they can conform to the nose intake contours. The placement guide is A-4 in size and folded in half to give you four sheets that carry full colour left hand side profiles of each option on one sheet, full colour upper surface views of both a Kittyhawk and a Tomahawk option on the next and left and right hand side, and upper and lower surface line drawings to show placement of stencil data on the fourth page. The placement guide carries detailed notes for each option as well as paint matches and mixing formulas to produce the required shades. Extracrylics, Polly Scale, Tamiya and Model Master are the featured paints. 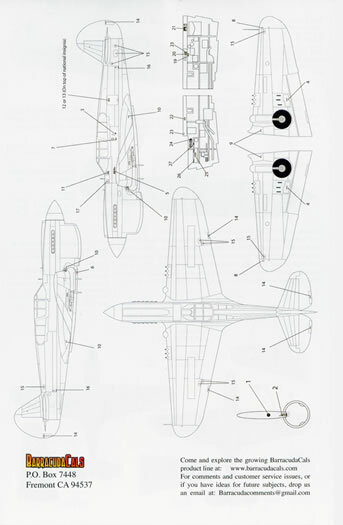 The suggested kits are the Monogram P-40 B/C and the Hasegawa P-40E. The placement guide, application instructions and three decal sheets come packed in the industry standard clear plastic zip-loc bag. Nitpicks? A minor one only in that there are no right hand side profiles to determine the camouflage pattern. This is another great sheet from Barracudacals. It combines first rate decals with excellent research and provides you with some interesting options to finish your P-40C and P-40E kits in other than Pacific theatre markings.